B2. The person signing below certifies that he or she has full authority to make this application on behalf of the applicant and to make all agreements, representations, waivers, and undertakings stated in this transmittal form and accompanying materials. Copies of the documents demonstrating the authority are attached. B3.1. New TLD Application Process Overview, posted at <http://www.icann.org/tlds/application-process-03aug00.htm>. B3.2. New TLD Application Instructions, posted at <http://www.icann.org/tlds/application-instructions-15aug00.htm>. B3.3. Criteria for Assessing TLD Proposals, posted at <http://www.icann.org/tlds/tld-criteria-15aug00.htm>. The applicant understands that failure fully to follow instructions included in these documents will be a factor negatively affecting consideration of this application. B4.1. The Registry Operator's Proposal, with cover sheet and attachments and accompanying materials. B4.2. A Description of TLD Policies, with cover sheet and attachments and accompanying materials. B4.3. A Statement of Requested Confidential Treatment of Materials Submitted. B4.4. Fitness Disclosure of Registry Operator. B5. This application is accompanied by one CD-ROM containing files with items B4.1 and B4.2 above. Each item is provided in a common word-processing format and in HTML format. ( ) This application is accompanied by a check, drawn on a United States bank and payable to the Internet Corporation for Assigned Names and Numbers (ICANN), in the amount of 50,000 United States dollars. (X) At least five business days before submitting this application, the applicant has sent 50,000 United States dollars by wire transfer according to item I8.2 of the New TLD Application Instructions. This application is accompanied by a wire transfer receipt or other document identifying the wire transfer. The applicant understands and agrees that this $50,000 is only an application fee to obtain consideration of this application; that the fee will not be refunded or returned in any circumstances (except if this application is not considered due to failure to reach agreement on terms for confidential treatment); that there is no understanding, assurance, or agreement that this application will be selected for negotiations toward entry of an agreement with a registry operator; or that, if this application is selected, the negotiations will lead to entry of such an agreement or establishment of a TLD as sought in this application. The applicant understands and acknowledges that ICANN has the right to reject all applications for new top-level domains that it receives and that there is no assurance that any additional top-level domain will ever be created in the future. B7. In the event multiple TLD strings are proposed in this application, the applicant understands (a) that all parts of the application must apply, without significant variation, to all of the strings and (b) that, if ICANN determines in its sole discretion that one or more parts (such as the Business Capabilities and Plan or the Description of TLD Policies) apply to different proposed TLD strings in a significantly different manner, the applicant may be required to elect which of the strings to pursue in this application. B8.3. consult with persons of ICANN's choosing regarding the information in this application or otherwise coming into ICANN's possession. B9. The applicant understands that difficulties encountered by ICANN in verifying, elaborating on, supplementing, analyzing, assessing, investigating, or otherwise evaluating any aspect within or related to this application may reflect negatively on the application. In consideration of ICANN's review of the application, the applicant hereby waives liability on the part of ICANN (including its officers, directors, employees, consultants, attorneys, and agents) for its (or their) actions or inaction in verifying the information provided in this application or in conducting any other aspect of its (or their) evaluation of this application. The applicant further waives liability on the part of any third parties who provide information to ICANN or its officers, directors, employees, consultants, attorneys, and agents in connection with the application. B10. The applicant hereby authorizes ICANN (and its officers, directors, employees, consultants, attorneys, and agents) to publish on ICANN's web site, and to disclose or publicize in any other manner, all materials submitted to, or obtained or generated by, ICANN (or its officers, directors, employees, consultants, attorneys, and agents) in connection with the application, including ICANN's (or their) evaluations and analyses in connection with the application or ICANN's investigation or evaluation of the application, except to the extent set forth in a written and duly signed agreement between ICANN and the applicant on the terms for confidential treatment of particular materials or information submitted by applicant. The applicant grants ICANN and its officers, directors, employees, consultants, attorneys, and agents a license to use any copyright or other intellectual property that applicant may have in any portion of the application for this purpose. B11. The applicant hereby gives ICANN permission to use the applicant's name and/or logo in ICANN's public announcements (including informational web pages) relating to top-level domain space expansion. B12. The applicant hereby agrees, acknowledges, and represents that it has no legally enforceable right to acceptance or any other treatment of this application or to the delegation in any particular manner of any top-level domain that may be established in the authoritative DNS root. It further agrees, acknowledges, and represents that it has no legally enforceable rights in, to, or in connection with any top-level domain by virtue of its preparation or submission of this application or by virtue of ICANN's receipt of this application, ICANN's acceptance of the application fee, ICANN's consideration or other handling of this application, or statements made in connection with this or other applications ICANN receives. B13. The applicant understands and agrees that it will acquire rights in connection with a top-level domain only in the event that it enters one or more written, duly signed agreements with ICANN, and that applicant's rights in connection with that top-level domain will be limited to those expressly stated in the written, duly signed agreements. B14.2. the applicant hereby releases and forever discharges ICANN and each of its officers, directors, employees, consultants, attorneys, and agents from any and all claims and liabilities relating in any way to (a) any action or inaction by or on behalf of ICANN in connection with this application or (b) the establishment or failure to establish a new TLD. By signing this transmittal form, the undersigned certifies, on his or her own behalf and on behalf of the applicant, that all information contained in this application, and all supporting documents included with this application, is true and accurate to the best of his/her/its knowledge and information. The undersigned and the applicant understand that any material misstatement or misrepresentation will reflect negatively on this application and may cause cancellation of any delegation of a top-level domain based on this application. 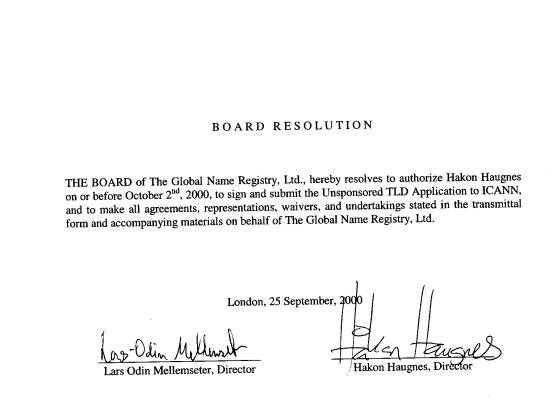 The Global Name Registry, Ltd.